Many of my friends are heading out of the big city as summer has arrived – fixated on spending time at their summer house, cottage, cabin or camp. It’s never been my ideal – but sometimes I get an inkling and think – well maybe this would work. 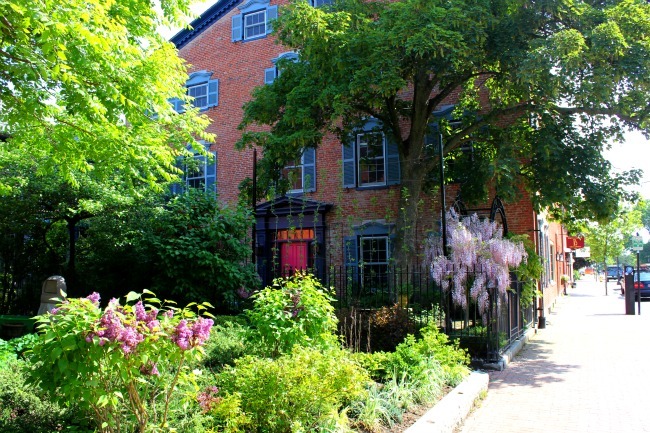 In the lovely town of Portsmouth, New Hampshire, this port city has luckily kept many of its historic brick buildings, commercial and residential. So as I walked around and checked out theatres, galleries, shops and museums, I spotted this lovely house. I first noticed the gorgeous garden, with its pretty flowers luring the eye. Then I saw the bright pink front door, a bold contrast to the red brick. What the photo doesn’t show is the lovely seating arrangement in the shade, a pale blue set of chairs that provides a perfect respite from the strong sun. So as I gazed at this home, I knew the inside would be just as interesting and lovely as the outside, and thought, this is the kind of place I’d love for the summer – in a small town and near the sea – but with all the amenities of my world.